« What Does A Stepford Wife Song Sound Like? Osmosis is a chemical terminology that means the tendency for a less concentrated solvent to move in and occupy the area with a more concentrated solvent. I have noticed that the tendency of passing time is for areas of lesser substance to permeate those of greater substance, thereby diluting it, making it weak. This applies for culture, cultural behavior, cultural patterns, and the general way we carry and present ourselves. In fact, I would go so far as to say that the quality of products in the last 50 years have gone steadily downwards. When it comes to the way we present themselves as women, osmosis is readily apparent. The weaker culture continues to permeate how we use to be. Women today are loud, foul-mouthed, obnoxious, belligerent, violent, and unkempt. English has almost become a second language in the States. Is it any wonder that we have lost the vocabulary of femininity? 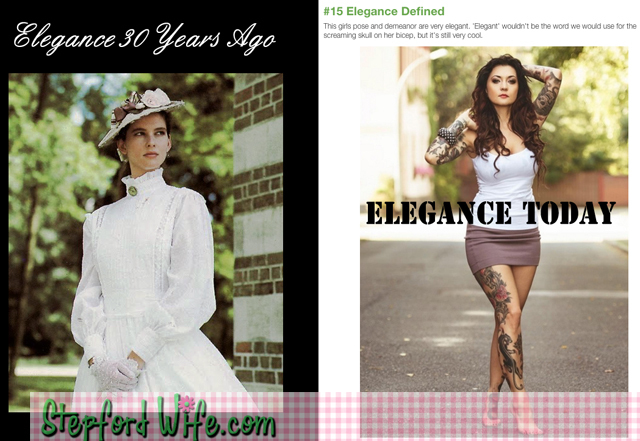 We need to return to the golden age of modesty, chastity, and willing deference and docility to our husbands and men. That is the only way to push out the lesser, coarse elements that are constantly threatening to eradicate the way proper wives and women once were. This entry was posted on Friday, May 24th, 2013 at 7:55 am	and is filed under Fascinating Womanhood, Stepford Wife Fashions. You can follow any responses to this entry through the RSS 2.0 feed. You can leave a response, or trackback from your own site.